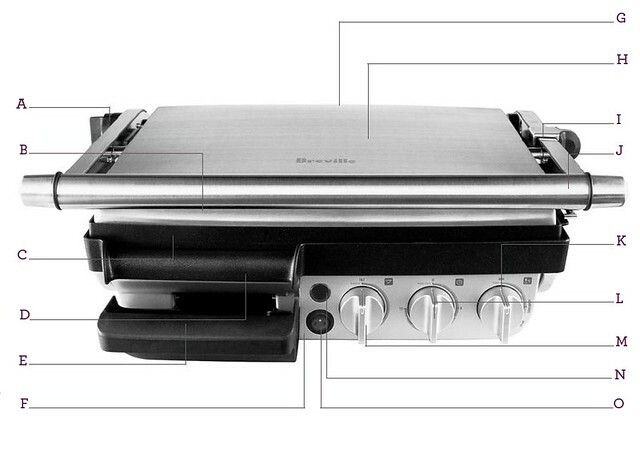 The Breville Die-Cast Indoor BBQ & Grill™: Non-stick, easy clean surface for perfect grilling indoors. 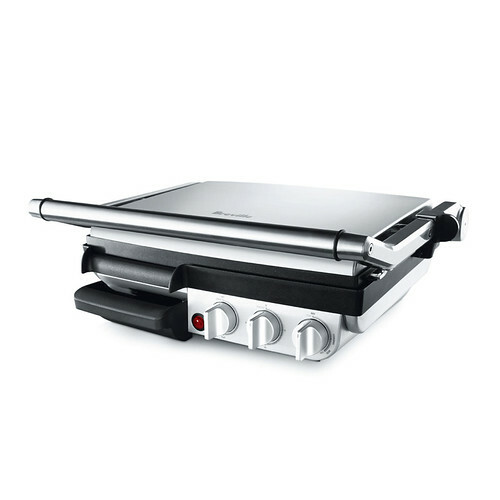 This die-cast indoor grill features adjustable height control for extra versatility. The top plate can be set to six preset heights. On lower settings, this patented feature reduces the weight pressing on more delicate foods for an even grill. Higher settings are ideal for open-face sandwiches and grilled pizzas. A. Grill Lock Dial. B. Stainless Steel Housing. C. Non-stick Ribbed Top Cooking Plate. D. Non-stick Flat Bottom Cooking Plate. E. Removable Drip Tray. F. 1500 Watt Heating Element. G. Cord Storage. H. Floating Hinged Top Plate. I. Adjustable Grilling Height Control. J. leveling Handle. K. Variable Temperature Control Dial. L. 15 Minute Timer Dial. M. Base Plate Tilt Dial. N. Heating Light.